Yes, we know, William Morris made his first car in 1913. But this is definitely a Morris. The difference is that it is a steam car – manufactured around 1911 by H. E. & F. Morris of 4, Athelstane Mews, Stroud Green Rd., London, N. The picture comes from the Morris advertisement in the December 1911 issue of The Automobile Owner and Steam & Electric Car Review. 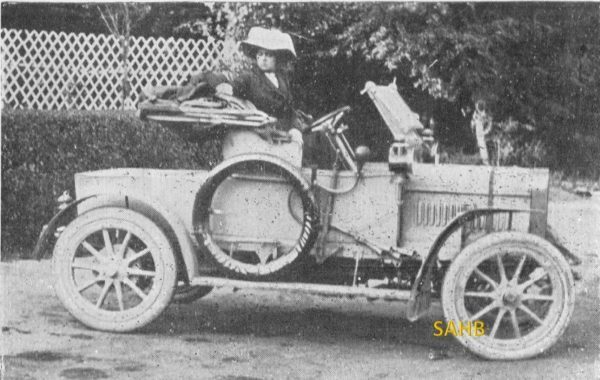 In the same issue there is another picture, this time of a Morris Landaulette, captioned “Comfort in Steam Cars.” Somebody – either the brothers themselves or their advertising agency – decided to change the spelling of their name between 1903, when they advertised as H. E. and F. Morriss at the same address, and 1911. Georgano states that the brothers, H. E. and F. E. Morriss (sic) of London brought out a steam car in 1908, with a two-cylinder slide-valve engine mounted under the floorboards and a single chain drive to the rear axle. The boiler burned paraffin and was mounted under the bonnet. Our picture is almost certain to be of this type of car, and is similar to an image on the Virtual Steam Car Museum website, but with a different two-seater body. Grace’s Guide confirms that H.E. Morris was a member of the Institution of Automobile Engineers in 1906/07 – but it also tells us that Frank Edward Morriss was a pioneer of British steam cars, and played an active part in the London to Brighton run. He was in 1904 Motor-Engineer to H. M. the King, based in Sandringham Motor Works, King’s Lynn, and was later connected with the makes Sandringham and Morriss-London. We would love to hear from anyone with more information – in particular the owner of the surviving example.